I’m writing this article because I am seeing far too many bitcoin (BTC-USD) (COIN) (OTCQX:GBTC) articles recently that express a far too one-sided bullishness about the prospects for the bitcoin price. I have written about this topic in August, in the context of the possible relation between the post-January 2018 cryptocurrency crash and the global financial market downturn this year. But in this article, I am expressing my bearish view on bitcoin more clearly and directly, as a cautionary warning to all readers. That’s why I’m putting a low price and a time scale in the headline, to get people’s attention. If we had a guessing game, and we had to guess “What will be the lowest price range bitcoin trades at during the rest of 2018 and all of 2019?”, my guess would be around “$900 to $1,000.” I think it’s about 50-50 whether the actual low price will be above that or below that. Every potential price movement in markets is probabilistic. Nothing is certain, nothing is 100% or 0%. If I had to specify a number, I would say there’s a 50% chance bitcoin is below $1,000 sometime this year or next year. But the actual probability could be 90% or 70% or 30% or 10%. I don’t think the odds of this happening could be any lower than 10%. Now some bitcoin bulls may complain that a minimum 10% chance of a crash below $1,000 is no reason or justification for writing an article with my headline. I strongly disagree. Imagine if investors knew there was at least a 10% chance that a major stock holding like Apple (AAPL) could crash 85% by next year. I think they would appreciate being warned about it in advance! One of the biggest warning signs for me is the complacency and smugness I see among bitcoin and crypto bulls recently and currently. Anyone who watched CNBC’s recent week of specials on bitcoin and crypto had a chance to witness this. The look on their faces conveys the impression of “What, me worry?” They act like they are not the least bit concerned about the risks involved with investing in and trading bitcoin and cryptocurrencies. It is all well and good for a bitcoin diehard since 2011 or so to have an attitude that they can survive anything, they’ve been through multiple bear markets with 80% to 90% drawdowns, it’s normal, it’s happened before, they can deal with it. But the reality is that the stakes are far higher now than they have ever been before. It’s one thing to have huge bull and bear markets in relative obscurity with most of the world not paying attention. It’s a completely different thing to have the biggest bull and bear markets ever, playing out on the global stage with everybody watching – and with a lot more people’s money involved. If you are a bitcoin millionaire who lives in a treehouse and pays no rent, sure, it’s no big deal, you can survive any crash, you will be fine if bitcoin falls below $1,000 or even if it goes to zero and disappears like Enron or Pets.com stock. But for normal people who invest their hard-earned money in bitcoin, a crash below $1,000 is a big deal. Another reason I put the $1,000 price in the headline, is that I am seeing too many analysis projections that even if bitcoin fails to hold the $5,900 to $6,000 support level, the ultimate bottom will be around $5,000 or $4,000 or $3,000. Even a $3,000 bitcoin price bottom projection fails to convey a true sense of the risk and danger of investing significant amounts of one’s money in bitcoin right now. This is an extremely dangerous way of thinking. And talk of potential price bottoms anywhere from $3,000 and up encourages this way of thinking among speculative-minded retail investors and traders, whether or not the author who says numbers like this actually recommends this approach or not. The point is, I was not an early investor in bitcoin. Not at all. I was just riding the momentum that was already in full swing in the spring of 2017. So my $1,700 buy price was not a low price for bitcoin by any means. It was right in the middle of a huge upward momentum swing that began below $1,000. Conclusion: If bitcoin could have a huge upward momentum swing last year from below $1,000, through $1,700 and $2,000, and up to $3,000 – then it can also have a huge downward momentum swing next year from $3,000, down through $2,000 and $1,700, on its way to below $1,000. The present moment in the bitcoin and crypto market, looks a lot like the dot-com bubble circa August 2000. The dot-com bubble topped and peaked in March 2000. But at the time, not everybody knew it. Mark Cuban knew it, but most of the market and especially most dot-com investors were not as smart as he was. 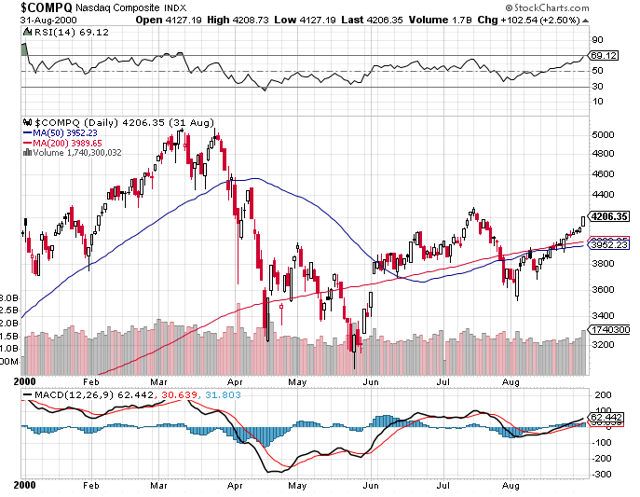 Notice that by August 31, 2000, the Nasdaq Composite price was above the moving averages, and the 200-day moving average was still sloping upward. Based on the attitudes of many bitcoin and crypto bulls still full of enthusiasm in this market, I do not think we have reached anywhere close to 2001 or 2002 levels of pain in the sector. The percentage losses may be similar, but percentage losses of different stages can vary from one bubble collapse to the next. I’m very concerned about the possibility that many bitcoin and crypto bulls are “averaging down” right now by buying more bitcoin at current levels around $6,000-$7,000. They think it is a bargain compared to December and January when it was $10,000 or $15,000 or $19,000. This is the kind of behavior that ruined many traders, investors, and hedge funds in the 1997-1998 Asian financial crisis. That included many very talented and successful traders, investors, and hedge fund managers, by the way, including some very famous names. They “averaged down” all the way down to their destruction. If major global players are buying bitcoin with leverage right now, in an attempt to rectify their losses since January 2018, they could be setting themselves up for hundreds of billions of dollars worth of ruin. 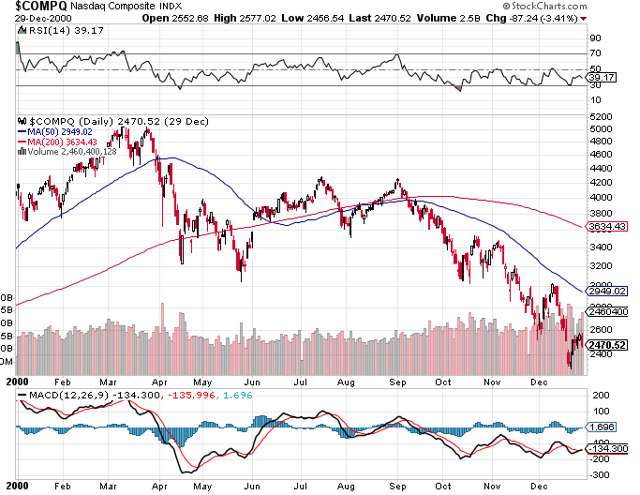 At that point, it could become a contagion that spills over into the rest of the global financial market system. The current paper losses of major global players in crypto may not be known to anyone yet. I’m concerned by the fact that even myself, who simply rode the momentum of 2017 by getting on in the middle, could have held bitcoin through today and still cashed out for almost a 300% gain. This tells me that we are nowhere even close to a bottom yet. Only when everybody who bought in the mania beginning in spring 2017, at any price over say $1,500, is facing big losses on their entire investment – only then will I believe we may be truly approaching a bottom in bitcoin. And that will be at around the $900-$1,000 bitcoin price level, in my estimation. Please note: I am NOT shorting bitcoin or crypto in any way. I do not stand to make any financial gain if people sell their bitcoin or crypto based on this article. I simply want to caution and warn people about the dangers and risks of buying bitcoin and crypto right now, at a moment when many people seem to believe that the risks have now been reduced. They have not. A crash from $6,000 to $1,000 is even more painful than the crash from $19,000 to $6,000. One more note of caution: I am not saying to jump in and buy bitcoin at $900 or $1,000 either. The price could drop even lower. If it can’t get back up into 4 digits, the 3-digit price could easily head back toward $100. It has happened before. It could be $10 or $1 or $0.10 or $0.01. It’s not like it has never traded at those prices before, even within the adult lifetimes of millennials. The bottom line is this: It is best to simply stay out of this market completely. Leave it to the daredevils living in treehouses, and to the professionals who know how to short sell risky volatile assets without the trade blowing up in their faces. An investor has no obligation whatsoever to participate in every market. In my view, bitcoin and crypto is a good market to sit out for the next couple of years. Not many people are writing things like this, because an author can’t make much money by writing things like this. No one will pay very much for advice like “Sit this one out for the next 2 years.” Always keep that in mind when you read investment analysis writing. Nevertheless, I will say it again: Stay out of this market for the next couple years. 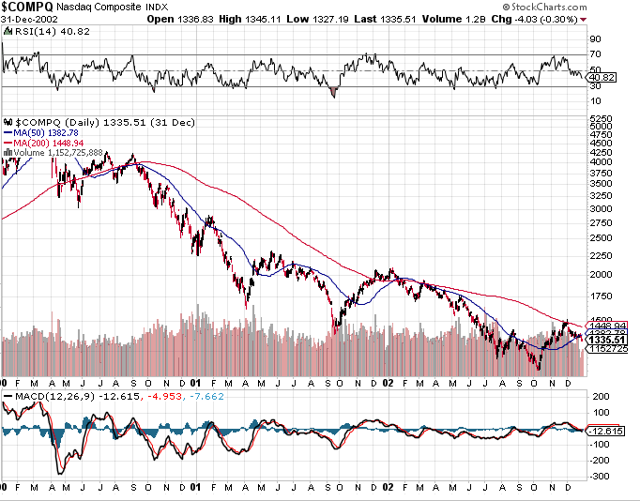 My main focus on the long side right now is junior gold miners, platinum miners, and silver miners. My subscription service the Stock & Gold Market Report offers stock picks for 7 junior gold miners, 2 platinum miners, and 1 silver miner. If you are interested in pursuing big gains in this sector, I encourage you to check it out and subscribe today! Additional disclosure: I sold almost all my cryptocurrency in December 2017. I still hold tiny amounts of bitcoin.